Cyclopentane is a highly flammable hydrocarbon employed to manufacture synthetic rubber, resins, and rubber adhesives. It is also employed as a blowing agent for polyurethane foam, which is further utilized to insulate refrigerators and freezers. Cyclopentane has zero OPD and low GWP. In addition, it has the minimum k-factor and high dimensional stability due to its bulkiness. It provides excellent insulation and adhesion to liners or panels. Polyurethane foam manufacturers are major consumers of cyclopentane as a foam-blowing agent. Foam-blowing agents are essential additives required in the manufacture of polyurethane foams. These agents induce the formation of cellular matrix structures within the substrate in order to yield a foam-like formation. Thermal insulating properties of rigid polyurethane foams with cyclopentane as a blowing agent provide important energy- and environment-related benefits. Rigid polyurethane foams with cyclopentane are primarily designed to reduce transfer of heat through building structures and electric appliances such as residential as well as commercial refrigerators. This, in turn, reduces the effect of global warming. Greenhouse gases such as methane, carbon dioxide, and nitrous oxide exist naturally in the atmosphere. Also, they are released in large quantities as a result of human activities. In view of the current trend of increasing emissions of most greenhouse gases, their atmospheric concentrations are expected to increase in the next few years. A major issue with refrigeration is ozone-harming chemicals and greenhouse gases released into the atmosphere. Cyclopentane is one of the cost-effective solutions after the phase-out of HCFC-141b, as it offers the maximum initial R-value, good peel adhesion, and good solubility with existing raw materials. Several foam manufacturers have chosen cyclopentane to replace HCFC-141b, due to its low cost and zero ODP and low GWP. This is expected to boost the demand for cyclopentane for use as a blowing agent and refrigerant during the forecast period. Cyclopentane is less potent as a global warming agent than fluorocarbons and it does not break down into acids, unlike fluorolefins. All these factors are projected to propel the global cyclopentane market during the forecast period. Based on application, the global cyclopentane market has been segmented into residential refrigerators, commercial refrigerators, insulating construction materials, analytical & scientific applications, and others. Phase-out of compounds such as HCFCs, HFCs, and CFCs under the Montreal Protocol drives the global cyclopentane market. Approximately 50% of all discarded household cooling appliances across the world contain chlorofluorocarbons (CFCs) and hydrochlorofluorocarbons (HCFCs) as well as other fluorinated compounds (such as HFCs), which significantly contribute to warming of the atmosphere and depletion of the ozone layer. Under the Montreal Protocol; HCFCs, HFCs, and CFCs that are used as refrigerants, as solvents, in fire protection, and in insulating foams are being phased out, due to rising consumer interest in ozone-depleting substance (ODS) alternatives such as cyclopentane. Global warming potential (GWP) of HFCs is up to 3,000 times that of CO2. Replacing HFCs with greener refrigerants having low upfront costs can result in 10%–50% of improvement in energy efficiency. All these factors are likely to boost the demand for cyclopentane during the forecast period. Among products, foam-blowing agents is a leading segment of the global cyclopentane market. Surge in the demand for eco-friendly blowing agents for use in processing of PU foams is likely to boost the global cyclopentane market during the forecast period. Cyclopentane has shorter chemical lifecycle compared to that of halogenated saturated hydrocarbons such as methane or CO2, which have chemical lifecycle ranging from several months to several years. Cyclopentane is used as a blowing agent in the production of polyurethane foams. Cyclopentane-blown polyurethane foams are complex in their composition. They meet stringent environmental and safety requirements, while providing high insulation performance at stable processing conditions. This is likely to drive the demand for cyclopentane in the near future. Europe dominated the global cyclopentane market in 2017, followed by North America and Asia Pacific. Most companies manufacturing residential refrigerators in Europe prefer cyclopentane over other conventional technologies, due to its high blowing efficiency and excellent thermal properties. Thus, the cyclopentane market in the region is expected to expand at a significant pace in the next few years. Major manufacturers are engaged in the production of cyclopentane for use in the refrigeration industry. The U.S. Government promotes usage of rigid polyurethane foams blown with cyclopentane in household and commercial appliances, primarily for refrigeration applications. Under the Montreal and Kyoto Protocols, production of several substances responsible for ozone depletion such as CFCs and HCFCs would be phased out in the U.S. in the next few years. This is expected to boost the cyclopentane market in North America in the near future. In Asia Pacific, the demand for cyclopentane in countries such as China, Indonesia, Japan, Thailand, and South Korea has increased due to implementation of several supportive policies by governments and public–private partnership programs for removal of HCFCs. For instance, replacement of CFC-11 and HCFC-141b with cyclopentane, as it does not release ODS into the atmosphere during XPS production. Most companies offer differentiated products for specific applications. Launch of new products, capacity expansion, brand promotions, and mergers and acquisitions are estimated to offer growth potential to companies operating in the global cyclopentane market in the near future. Rise in the demand for blended cyclopentane and increasing usage of cyclopentane in analytical and scientific applications such as resins, lubricants, and additives are expected to provide lucrative opportunities to manufacturers of cyclopentane in the next few years. Major manufacturers operating in the global cyclopentane market are Chevron Phillips Chemical Company LLC, Maruzen Petrochemical Co., Ltd, HCS Group GmbH, Pure Chem Co. Ltd., INEOS Group Ltd. Haldia Petrochemicals Limited, Guangdong Dymatic Fine Chemical Co., Ltd., Trecora Resources, and Yeochun NCC Co., Ltd.
Cyclopentane is a flammable hydrocarbon used in the manufacture of synthetic resins and rubber adhesives. It is also used as a blowing agent in the manufacture of polyurethane insulating foam, which is employed in several domestic appliances such as refrigerators and freezers, thereby replacing environmentally hazardous alternatives such as CFC-11 and HCFC-141b. The cyclopentane market is driven by technological innovations, socio-economic development, and rise in concerns about environment protection. These factors have increased the focus on energy-efficient appliances. Cyclopentane is approximately 4% more efficient than R134a foam. Various manufacturers in Europe and North America have retrofitted their production plants with the cyclopentane technology. Based on product, the global cyclopentane market has been classified into foam-blowing agents and solvents & reagents. Foam-blowing agents was the leading product segment of the global market in 2017. Rise in usage of cyclopentane in various applications such as residential refrigerators, chillers, and freezers is boosting the market. Major regulatory authorities, environment conservation activists, and governments across the world have signed pacts in the form of Montreal Protocol in order to completely phase out environmentally harmful foam-blowing agents such as CFCs and HCFCs by 2030. This, in turn, is expected to boost the demand for cyclopentane during the forecast period. Cyclopentane is used as a foam-blowing agent in the production of polyurethane insulating foam, which is used in refrigerators, freezers, water heaters, construction panels, and insulated pipes and roofs. Rising need for storing food products at a particular temperature is fueling the demand for refrigerators and freezers. In addition, increasing need for storing a range of medical devices and products in low-temperature conditions is augmenting the demand for refrigeration products in the health care industry. Surge in the adoption of refrigerators and freezers in food & beverages, health care, and pharmaceutical industries is expected to boost sales of insulators and, in turn, cyclopentane in the near future. 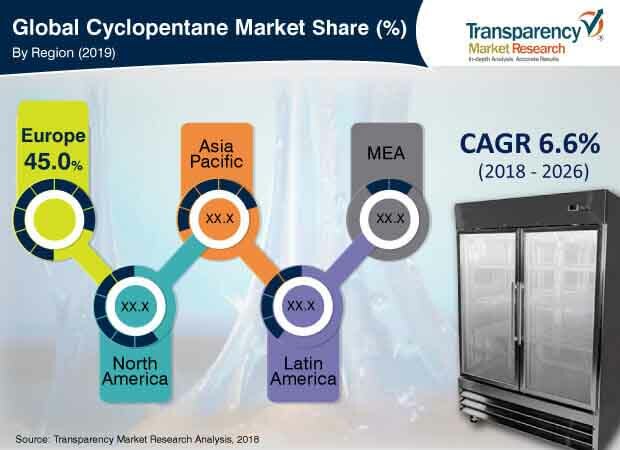 Based on application, the global cyclopentane market has been segmented into residential refrigerators, commercial refrigerators, insulating construction materials, analytical & scientific applications, and others. Residential refrigerators is estimated to be the major application segment of the global market between 2018 and 2026, owing to the rising demand for blowing agents for use in PU foams. It is likely to be followed by the insulated construction materials segment during the forecast period. Low energy consumption and low environmental impact are some of the factors propelling the global cyclopentane market. Use of appliances with potentially high GWP and ozone-depleting gases leads to increase in efforts required for recycling of appliances and causes high impact on the environment. This has created immense pressure on manufacturers to develop eco-friendly products. This, in turn, is augmenting the global cyclopentane market. Based on region, the global cyclopentane market has been segmented into North America, Europe, Asia Pacific, Latin America, and Middle East & Africa. Europe dominates the global market, followed by North America and Asia Pacific. Europe was a leading consumer of cyclopentane in 2017. Ban on HCFCs for use as blowing agents fuels the demand for cyclopentane in Europe. North America has also gradually shifted toward use of cyclopentane, due to stringent regulations imposed on HCFCs by various government bodies in the region. The market in Asia Pacific is expanding at a high growth rate, as the region is providing immense growth opportunities to regional as well as global manufacturers. Rise in population and increase in the demand for residential refrigerators and construction applications with low ODP are propelling the demand for cyclopentane in the region. Rise in government expenditure and launch of programs to phase out CFCs in Africa and Latin America are expected to propel the cyclopentane market in both Middle East & Africa and Latin America during the forecast period. The report analyzes and forecasts the cyclopentane market at the global and regional levels. The market has been projected in terms of volume (tons) and value (US$ Thousand) for the period from 2018 to 2026. The study includes drivers and restraints of the global cyclopentane market. It also covers the anticipated impact of these drivers and restraints on the demand for cyclopentane during the forecast period. The report highlights opportunities for growth of the cyclopentane market at the global and regional levels. The report comprises detailed value chain analysis, which provides a comprehensive view of the global cyclopentane market. The Porter’s five forces model for the cyclopentane market has also been included to help understand the competition landscape of the market. The study encompasses market attractiveness analysis, wherein product and application segments have been benchmarked based on their market size, growth rate, and general attractiveness. The study provides a decisive view of the global cyclopentane market by segmenting it in terms of product, application, and region. These segments have been analyzed based on the present and future trends. Regional segmentation includes the current and forecast demand for cyclopentane in North America, Europe, Asia Pacific, Latin America, and Middle East & Africa. The report also covers individual application segments of the market in every region. The study includes profiles of major companies operating in the global cyclopentane market. Key players profiled in the report are Chevron Phillips Chemical Company LLC, Maruzen Petrochemical Co., Ltd, HCS Group GmbH, Pure Chem Co. Ltd., INEOS Group Ltd. Haldia Petrochemicals Limited, Guangdong Dymatic Fine Chemical Co., Ltd., Trecora Resources, and Yeochun NCC Co., Ltd. These players account for a major share of the global cyclopentane market. Brand promotions and launch of new products are likely to increase sales of cyclopentane in the next few years. Market leaders look for different measures such as strategic pricing and product improvement to increase their profit margins. The report provides size (in terms of volume and value) of the global cyclopentane market for the base year 2017 and the forecast between 2018 and 2026. Market numbers have been estimated based on product, application, and regional segments. Market size and forecast for each product and application segment have been provided for the global as well as regional markets.